This past weekend, I ran my very first 5K! If you recall, running a 5K was one of the fitness goals that I set last year. Before that, I had never run more than 2 miles in a row, so I thought that making it to the 3.1 mile mark would be a reasonable step. Tamara and Maria, who are seasoned runners, were great about encouraging and supporting me in this effort – having friends like that really helps! I also got a lot of great tips from friends and blog readers – thank you! I jogged sporadically all last summer and fall, both outdoors near the lake and on the treadmill. But to be honest, that all dropped by the wayside once I moved into my condo. For one thing, the weather got really cold – fast! Also, my new building doesn’t have a gym. I still did other types of workouts, like pilates and yoga, but alas, no running. About a month ago, I decided that if I was ever going to do it, I should just sign up for a race to make myself do it. 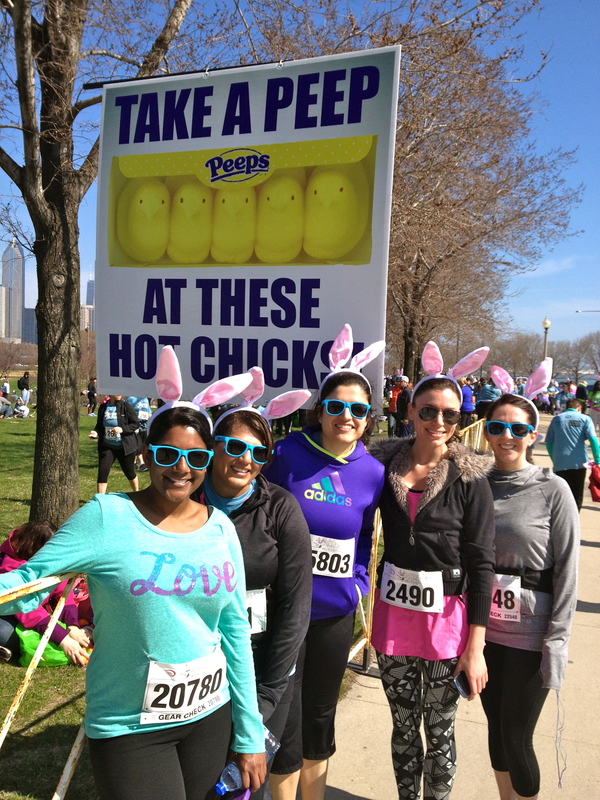 So this past Saturday, Maria, Tamara, Priscilla, Payal and I all participated in the Bunny Rock 5K! The race fees benefitted PAWS and had an Easter theme. 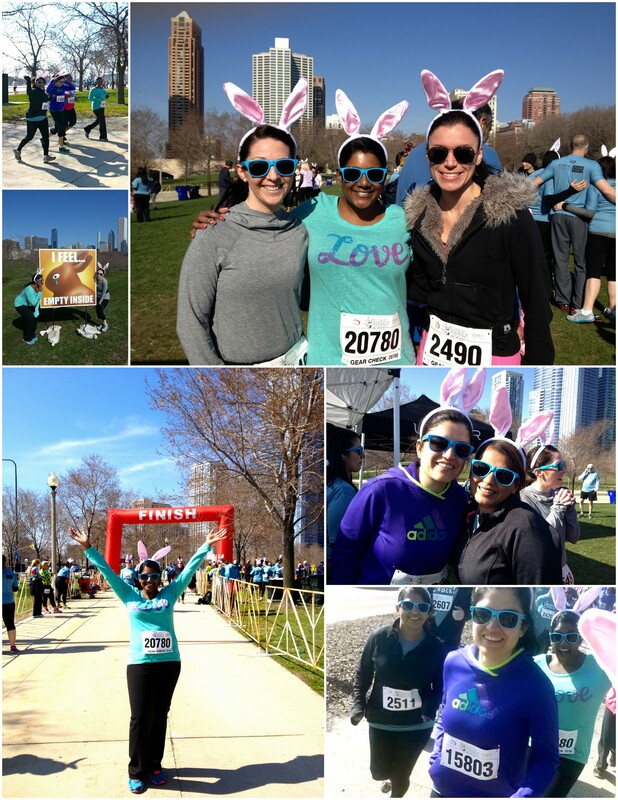 Because running is more fun when you’re wearing bunny ears and bright blue shades! I am pleased to report that I was able to run the entire 5K without stopping, hooray! The course started and finished in beautiful Grant Park, along Lake Michigan. We also lucked out with a gorgeous, sunny day. Basically, the ideal situation for your first race! Many friends who are experienced runners told me that it would be easier, and that I would run faster, being outdoors and surrounded by so many other people – I think they were right! Afterwards, Maria had us all over for the after party, where we were joined by our friend Sara. We also realized that it was a Friend-iversary of sorts, as I met Tamara and Maria at Ryan’s Easter party last year! No Easter Egg jello shots this year, but we did feast on a brunch spread of healthy dishes to continue the healthy start to the day. Having a sweet tooth, I had to bring desert, but I made sure that it was relatively good for you (all things considered). I tried my hand at a new recipe for Almond Cake, which turned out to be a big hit – recipe later this week! 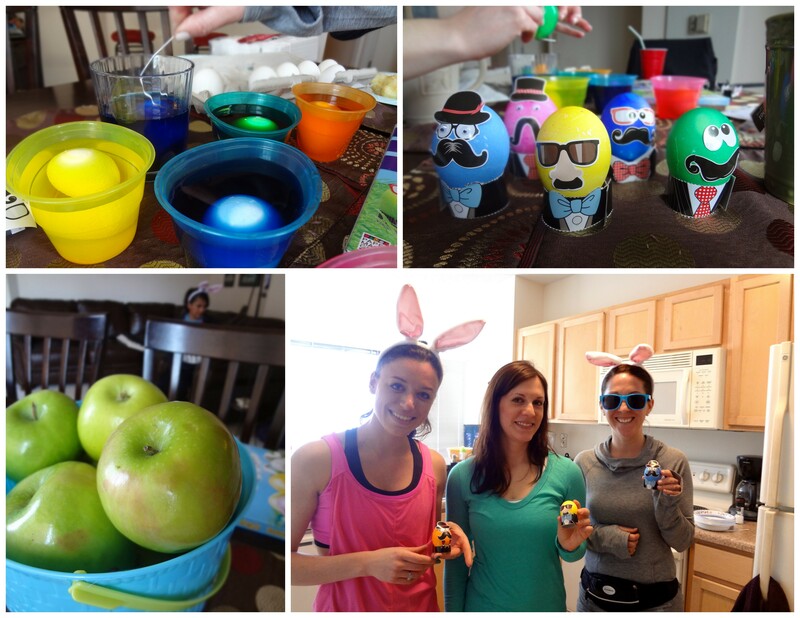 In the spirit of the Easter holiday we also dyed some eggs… check out our masterpieces! I had a great experience running my first 5K! While I don’t plan to become a distance runner any time soon, we’re already planning more 5K runs for the coming months. Who knows, maybe a 10K is in my future! WOW! So proud of you. That is great! Sorry, I haven’t been following as mich lately – so much going on, or you know I would have been one of those encouraging people. Well, I have no doubt that you can do whatever you set out to do. Congratulations! Thanks! So happy to hear from you Cathy 🙂 You actually ARE one of the people I was talking about – all our talks back in the day, and particularly when I started last year. I know how much you love running, and that really motivated me! Why, thank you Miss Marzipan! I wouldn’t say that I love it quite yet (still in the “are we done yet? !” stage) but hopefully I’ll feel that way soon! Thanks friend!! After years of reading about your running progress, I finally did it! I would LOVE to do a race together – let’s make it happen! Thank you so much for the kind words! My goal was to run the whole thing without walking or stopping so I’m really glad I was able to accomplish that. Loving the story and experience. Great for you Kavi!!! But… but…but… where are the famous Vegas Pink Fingernails? Haha, don’t worry – the pink nails are back after a brief hiatus! Calm down! Now just calm down Mr. SLR Nikon!!! Someday you will get a chance to photograph Kavi’s nails.